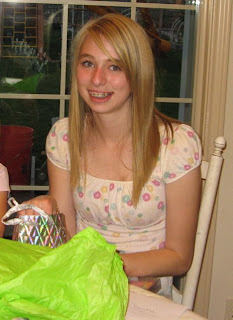 2011 in the Cole Sorority: Happy Birthday Christa! I can't believe Christa is 14 already. I really can't be old enough, can I? Christa is becoming such an amazing young lady. She is so self confident and talented in so many areas. Today she wanted to spend the day with friends. It's been interesting to watch her develop and expand her friendships this year, being in the junior high school. She gets along with lots of different groups of friends--church friends, choir friends, TVMSC friends, neighborhood friends, sports friends . . She has always made good choices with her friends, and we are grateful we can trust her judgement in that department. We may have to sign her up for text-messengers anonymous sometime soon, though. Thanks for being a good example to your sisters, Christa, and thanks for your willingness to work hard and do the right thing. We love you lots! hey christa i cant believe it either that u are 14 i miss you and your family sooo much. tell oyur sister and your parents i said hi and i love and miss them soo much. i hope i can see you soon. 14! Wow. Have a great year!